Take one sun-drenched island, spice with a lively Caribbean culture and add a dash of chic French cuisine and the result is the unbeatable dining scene on St. Barts. Glenn and I have been reviewing villas on St. Barts for a combined total of almost 20 years and one of the reasons we never tire of this tiny piece of paradise is the quality of the food. It is absolutely spectacular. When we're working, the promise of tuna tartar or grilled lobster at the end of each exhausting day is the carrot at the end of our stick. Knowing that I can sit back with the best salmon carpaccio served this side of Paris keeps me going during the weeks when we exam 90 villas in five days. Of course during the times I've visited St. Barts as a tourist, I've never needed an incentive to indulge in the gastronomic pleasures around the island. Just as we're unable to visit all of our favorite spots during each trip to the island, we haven't squeezed them all in here. This is just a sampling to get your taste buds – and your vacation plans -- going. And do get going – your lobster is getting cold! 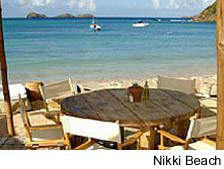 With its growing reputation as the place to be in the West Indies, St. Barts is always buzzing with something new. During our visit to the island this fall we discovered two new restaurants that have been added to the already stellar list of establishments. Nikki Beach, built on the perfect curve of white sand that is St. Jean Beach, is a hot new member of the Nikki Beach collection, joining the Nikki Beach restaurants located in Miami Beach and St. Tropez. The fresh white décor reflects the white sand of the beach while the wait staff's sun-soaked pareos add a lively splash of color. Trendy cocktails are whisked around to the tables while the latest world music pulses through the dining area. Two words: Vertical food. That's what we were served. The presentation of our spring rolls with shrimp and crab was a vertical work of art, a plate so pretty we were hesitant to cut into the amazing design. But of course we did, confirming the plump, fresh shrimp was ever bit as good as the presentation. Entrees and main courses focus on fresh seafood and include lots of fresh salads and pastas along with beef, lamb and chicken. Glen and I had the delicious salmon carpaccio and the tuna tartar. At the end of the meal we split a serving of white chocolate mousse served with a cinnamon biscuit. 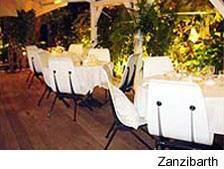 Another sophisticated new restaurant we had the pleasure to discover is Zanzibarth on Route de Saline. The restaurant is surrounded by a lush tropical garden that creates the feeling of a hidden oasis. The all-white interior is accented with angel light fixtures, white tables and white chairs. Romantic candlelight flickers from each table. We joined one of our local representatives and her sister for dinner and the four of us ordered four dishes to share. We started with a delicious pan seared foie gras served with Xeres vinegar and red fruit compote then sampled a unique asparagus, crab and avocado salad served with tomato concasse. We chose seafood dishes for our main course: Herb crusted sea bass and pan-seared sea scallops. Our "mixed dessert" included lemon sorbet with vodka, coconut flan and an irresistible crème brulee. The dessert menu also lists half a dozen coffee choices including café pucci with chocolate, almond liquor and cinnamon and there is a separate menu for champagnes and digestives. It's impossible to call a place that's been known around the world for more than 10 years new, but the recent re-invention of François Plantation has redefined an island classic. 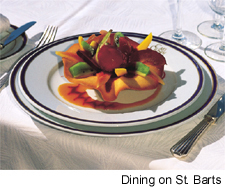 Francoise and François Beret arrived on St. Barts 30 years ago, long before the haute cuisine boom. 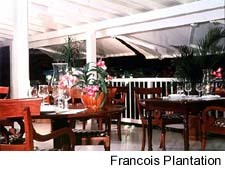 After 20 years of establishing several of St. Barts fine dining restaurants, along with the island's first boulangerie, François designed and built François Plantation, a place that has earned the reputation as one of the finest hotels in the Caribbean. Perched on the steep hillside in Colombier with breathtaking views of the entire island, the new Wine and Dinner Club offers a wide selection of wines by the glass served with a medley of international tappas. François maintains his tradition of importing fresh ingredients from France and continues to offer an exciting and tantalizing menu. The menu now includes a gazpacho of marinated scallops, local snapper with Caribbean spices, skewers of pineapple and roasted duck magret, and thinly sliced beef served with a reduced truffle sauce. Desserts include sorbets, banana pastry topped with passion fruit and warm chocolate cake. François Plantation is also known for its keen wine cellar with selections that include Drouhins, Leflaive, Petrus and second label Chateau Ausone.